About the time we're sighing with relief because winter is finally over, the pestiferous bugs show up, making life miserable for horse and human. Flies and biting insects aren't just a nuisance, they can carry some really serious diseases, like Pigeon Fever, West Nile Virus, and Equine Infectious Anemia. 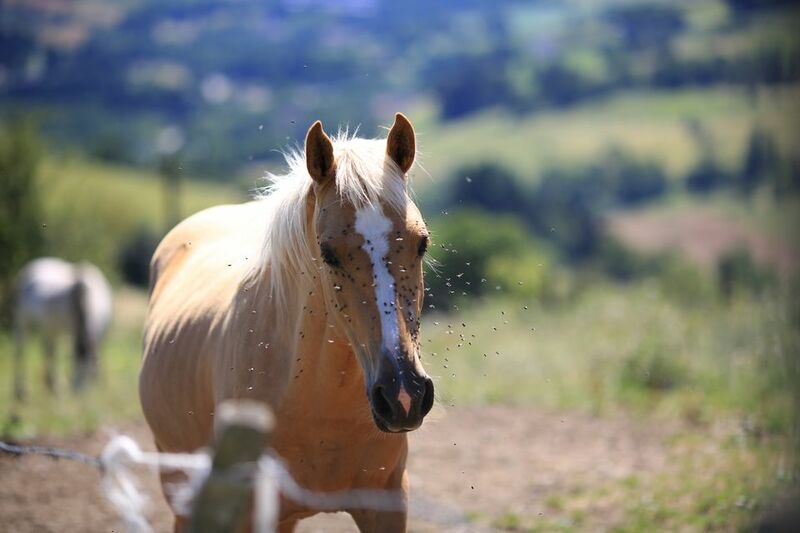 Protecting horses from flying and biting insects can be can be a challenge. While you can purchase commercial fly sprays, many people prefer to make their own concoctions. Before you start mixing and spraying, though, take some time to clean up your horse's stable and pastures with some natural pest control methods to reduce the number of bugs you're fighting. Many horse owners start repelling insects from the inside out. Garlic is a favorite supplement that's believed to help control flies. A University of Guelph study found that excessive feeding of garlic is actually harmful to horses, and the debate over whether garlic is safe for horses is ongoing. However, the small amount fed by most of us is generally considered safe and may help repel face and body flies. Cider vinegar is a common ingredient in many home-made fly sprays, and feeding it is popular, too. The vinegar is believed to make your horse less tasty to biting insects. You can add cider vinegar to your horse's feed or in their water, and you can combine it with crushed or powdered garlic, if desired. Essential oils and herbs are often used in homemade fly repellent preparations. I've had good results with lavender oil, and many people use eucalyptus and citronella oils. All are easily found in pharmacies, grocery stores, and health food stores. Pennyroyal is a common oil used in fly repellents, but it is toxic, so it is not a good choice for horses. You can make a simple fly-repellent using water or mineral oil and a few other ingredients. These sprays can be particularly effective against face flies. As you may already know, face flies can make a horse really frantic, plus they can carry disease. Combine the ingredients in a large spray bottle, and shake well. Spray the repellent onto a cloth, and wipe your horse's face with the cloth. Do not wipe around the top of the horse’s eyes because sweat may cause it to run down into their eyes and may irritate them. Also, if there is pink skin on your horse's face, put a little sunscreen on it and allow it to dry before putting the fly repellent on it. Carry a cloth with you to reapply the repellent when needed. This recipe is an oil-based spray for face flies. Mix the ingredients in a spray bottle and moisten a cloth with the spray to apply it to your horse's face, as with the water-based spray. However, note that this spray attracts dust, so don't use it before a show. As an alternative, you can mix seven parts water with one part citronella for a non-oily fly spray. Increase the concentration to four parts water to one part citronella during the worst of the fly season. Mix four parts vodka, grain alcohol, or water to one part lavender oil. This also smells nice and works for a short time. It also works well as a relaxing room or linen spray. The alcohol mixtures dry faster than water, while leaving the fragrant oil behind. Avon Skin So Soft is often recommended for fly control. I have found it to be very effective for blackflies in the spring. It’s not long-lasting, so it has to be reapplied often. It works on humans, too. Just wipe it on with a cloth. WD-40 is sometimes recommended as a fly spray. That's definitely not a use recommended by the manufacturer. This is a petroleum product that is designed to displace water, so it can't be good for a horse's skin. Other crazy concoctions, such as one man's diesel-oil repellent, are equally unsuitable and potentially harmful to a horse (not to mention smelly!). Dryer sheets are often recommended to repel flies, but I haven't found these to be very effective.